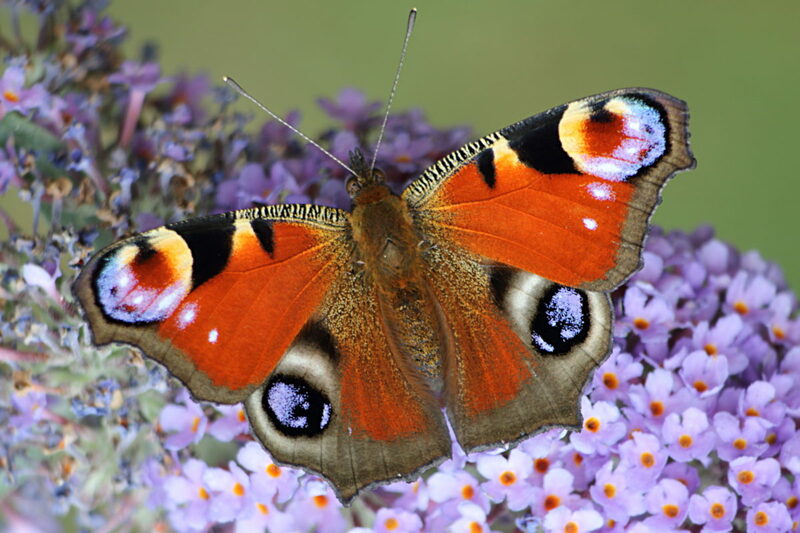 The emphasis of my wanderings this last week or so has been on butterflies. 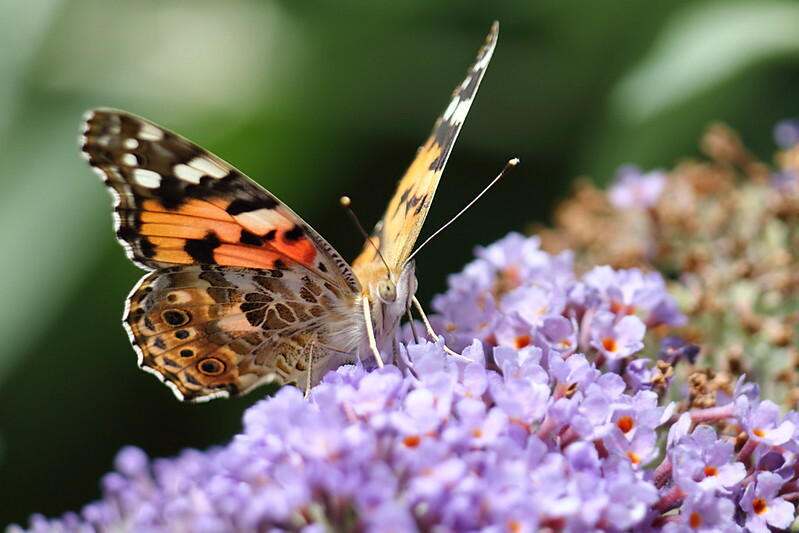 The Buddleia in the garden has been swarming with Large Whites and Peacocks with a fair sprinkling of Comma, Painted Lady and Red Admiral. 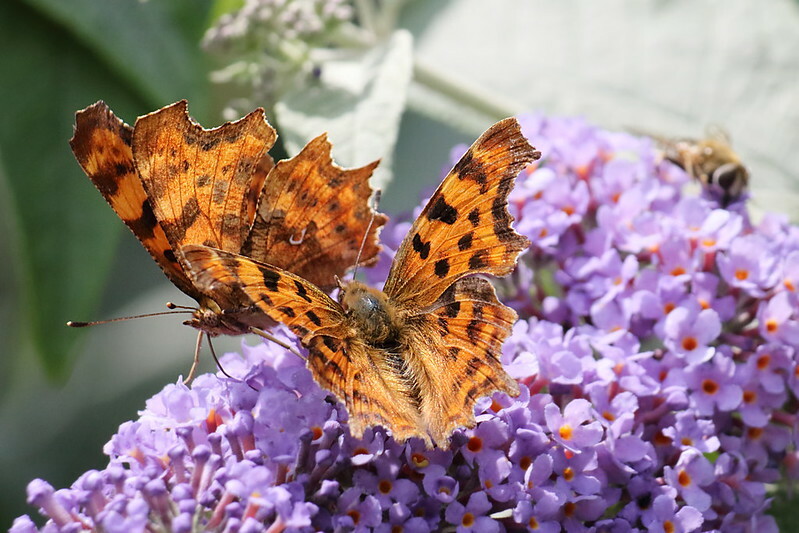 This, and tweets/postings re butterflies to and from @BCYorkshire, got me hunting in the garden and along Baildon Bank -> Baildon Green to just short of Midgeley Wood. 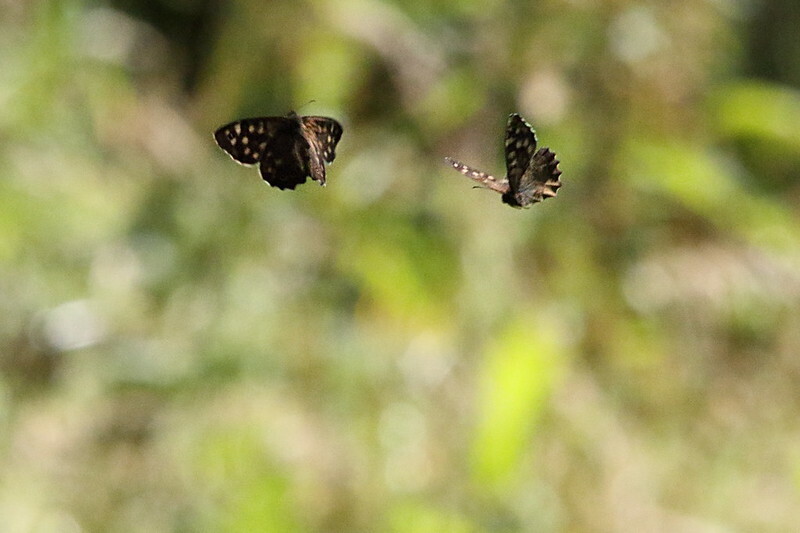 Apologies for starting off with a rubbish photo but I think this is the first time I have noticed one of these butterflies. The post is quite long but I hope you like the photos and as usual they are on flickr within an album that has more photos. 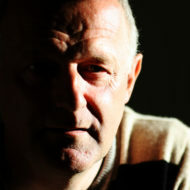 Feel free to visit the album to see the others or click on an image that will take you to that image in the album. Hopefully I have identified most things correctly but if you are an expert feel free to put me right. 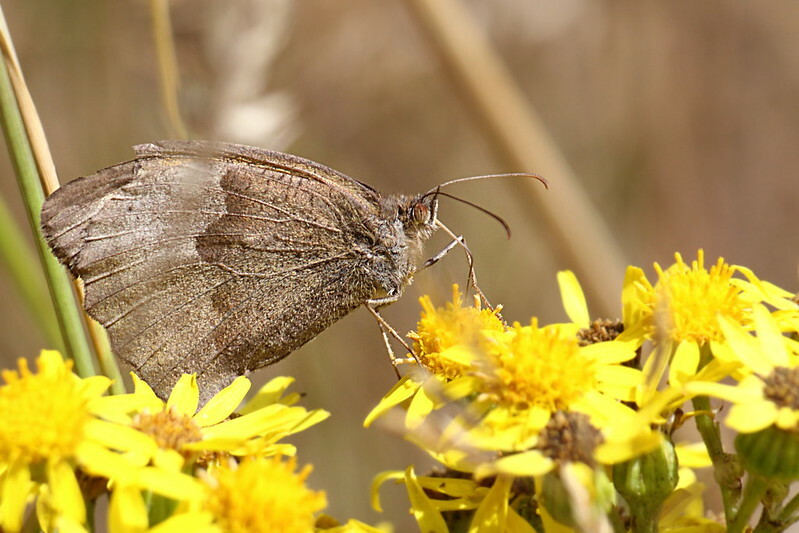 I think this is a Purple Hairstreak (Favonius quercus). It is on the leaves of an Oak tree at the western end of Baildon Bank. After starting with a poor photo I’ll move on to some better ones. Well at least I think they are better. 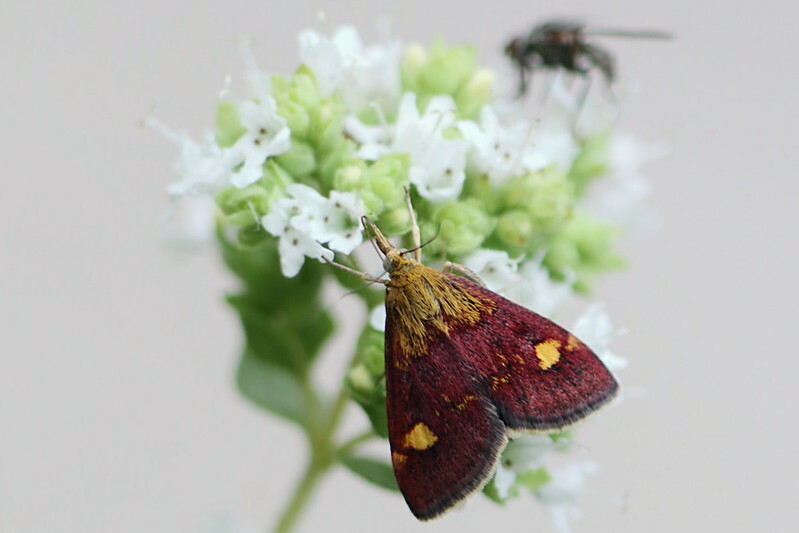 This is a Mint Moth (Pyrausta aurata). 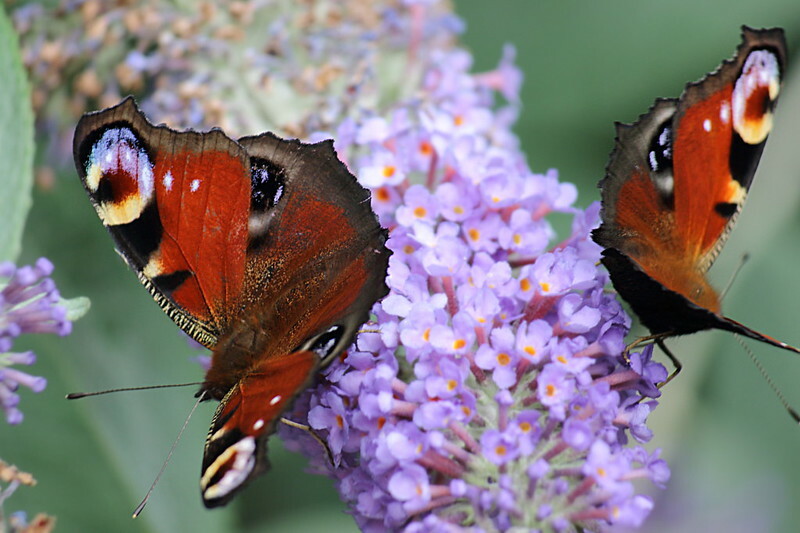 We appear to have 2 in the garden, 1 on each clump of Oregano. 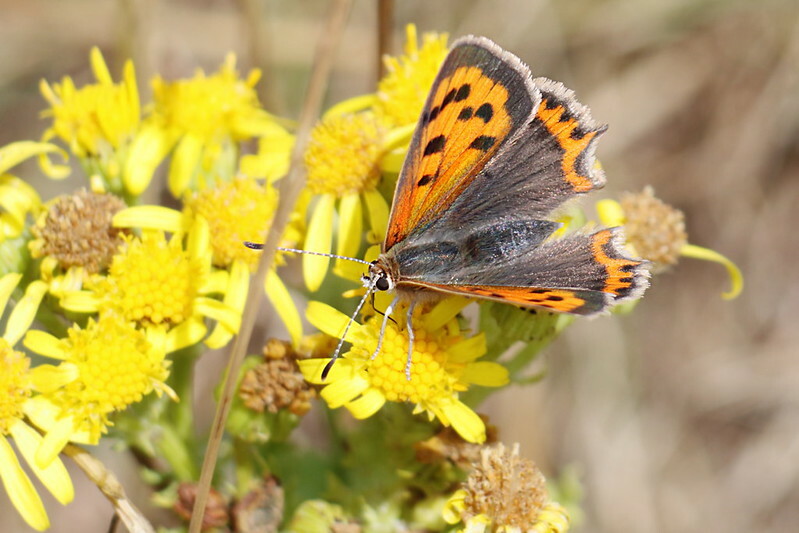 They are small and can very easily hide under small leaves. At full stretch it is about 1.5 cm across = small. 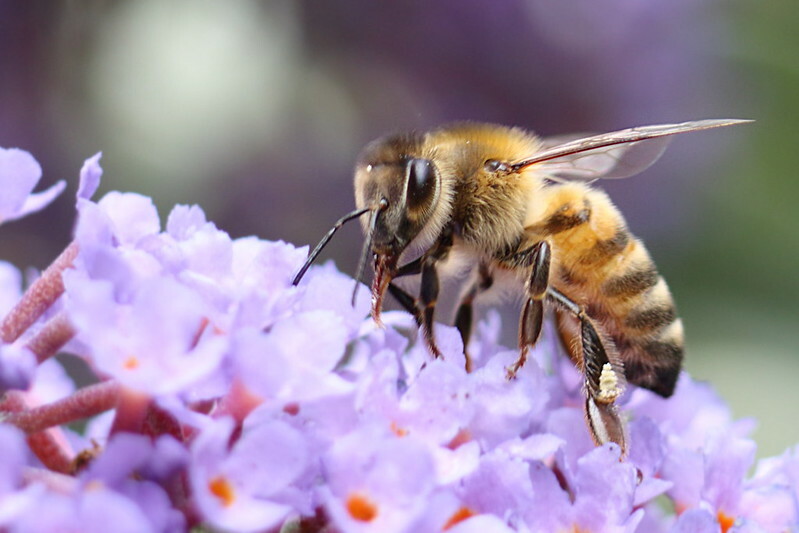 There are more photos of it in the flickr album that show it with wings stretched looking almost as bis as the bee that is behind it. 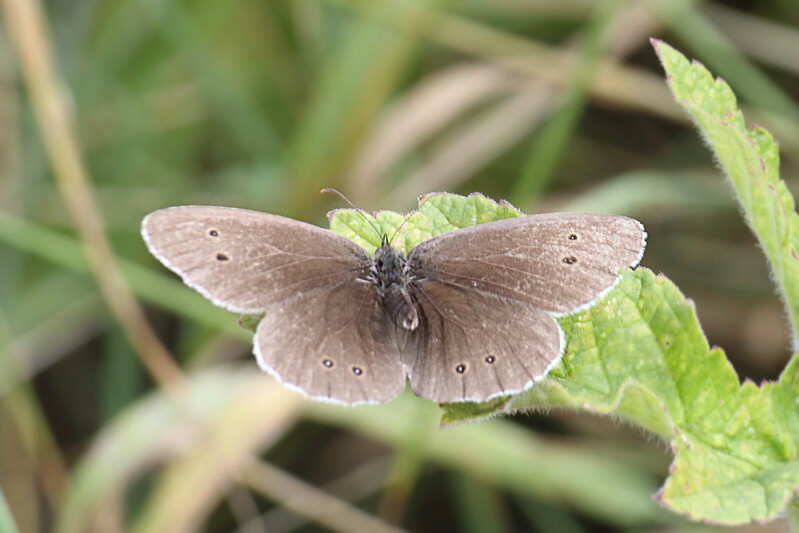 Another shows the underside of its wings. 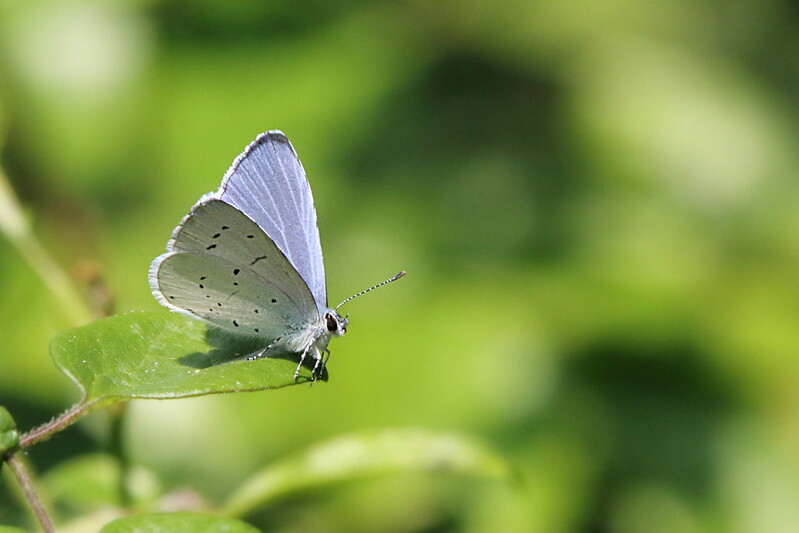 A small butterfly we have had in the garden is the Holly Blue (Celastrina argiolus). 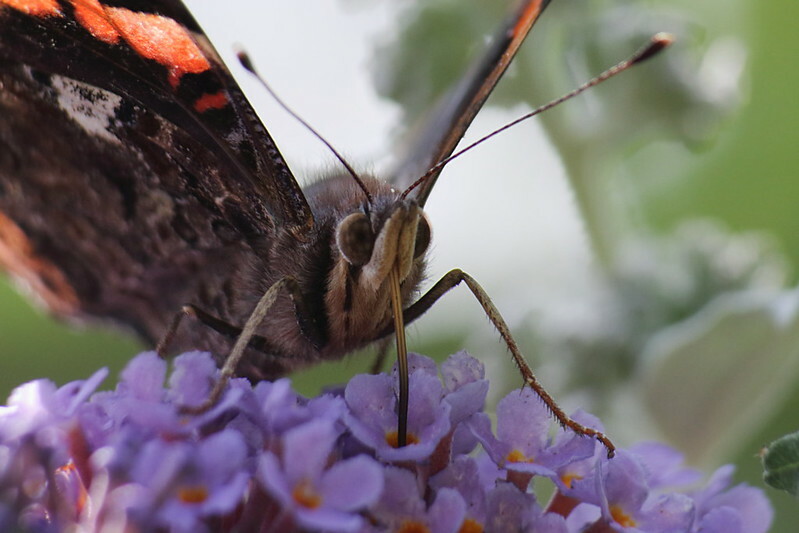 Here it has settled on the Oregano but is usually just flitting through. 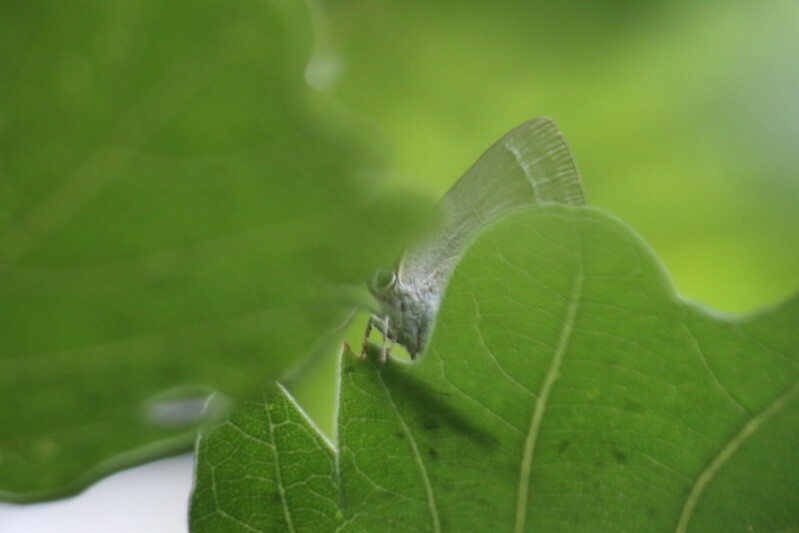 I also managed to spot Holly Blue on an apple tree and blackcurrant bushes near the back of Baildon Community Link. 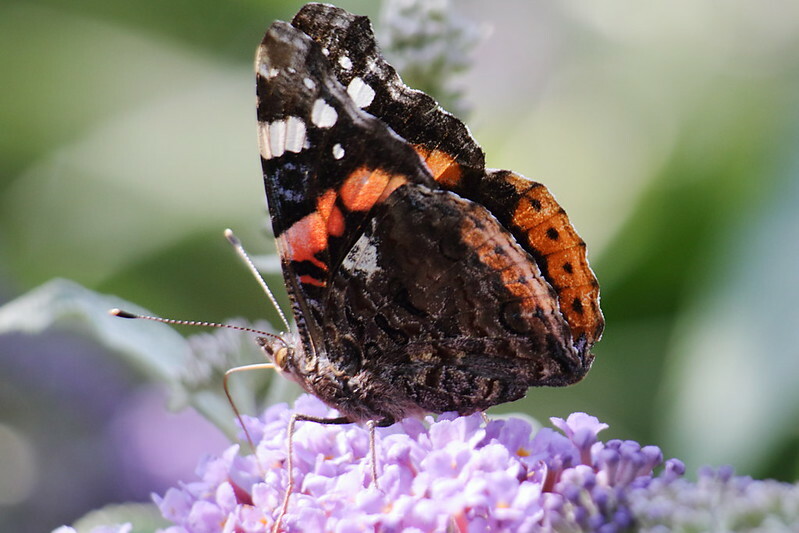 A larger butterfly that we have had on the Buddleia is the Red Admiral (Vanessa atalanta). This shot was getting quite close and personal. 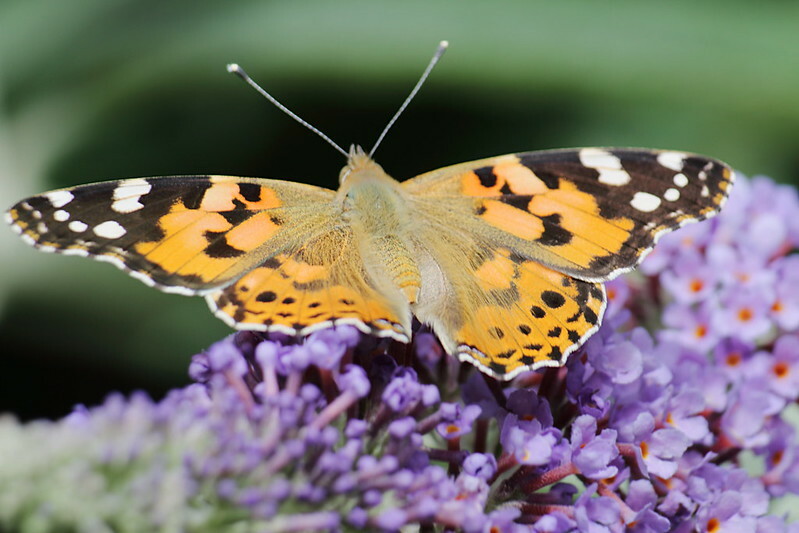 Painted Lady. 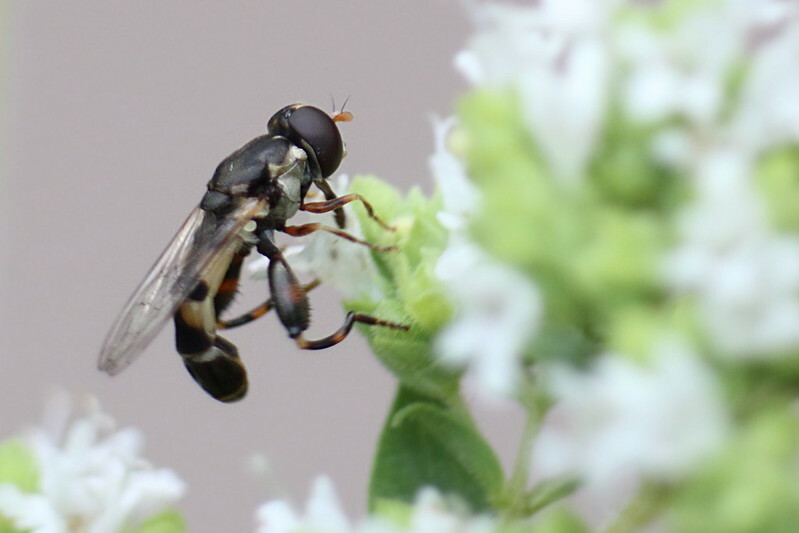 This one shows its spread wings. 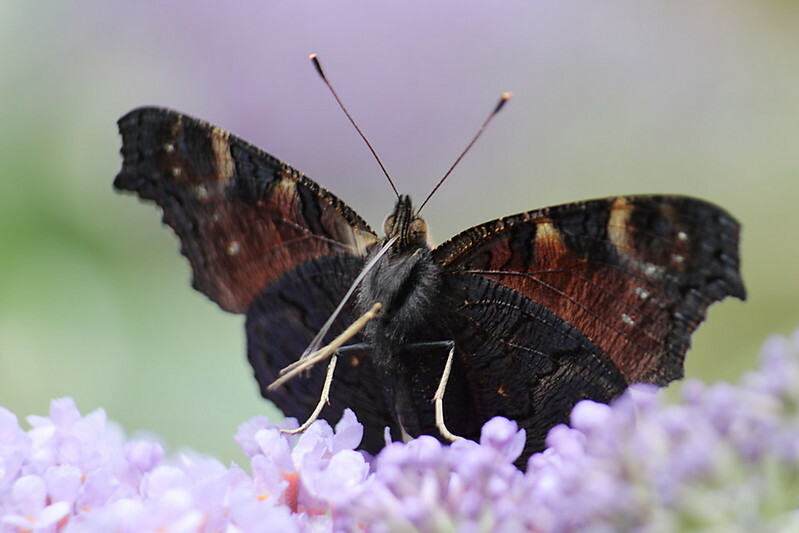 This Peacock (Aglais io) that visited the Buddleia looks as though it is cleaning its proboscis using its front legs. 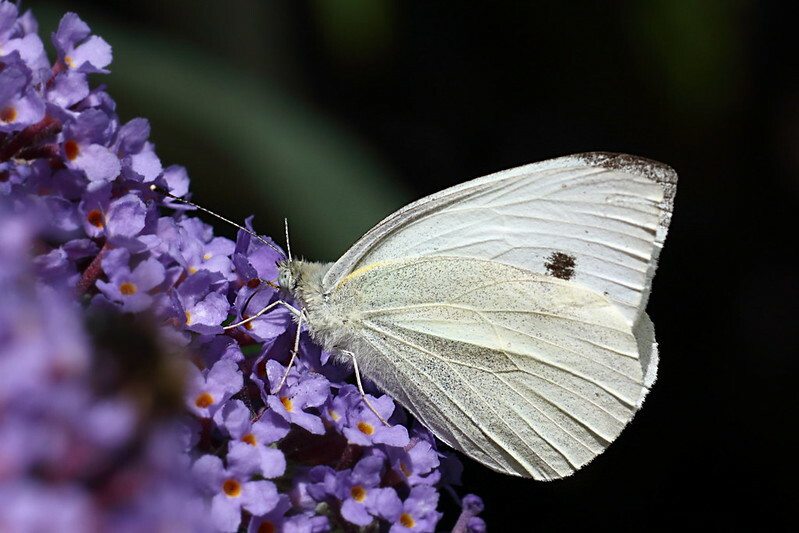 Many Large White (Pieris brassicae) have been fluttering through the garden and sometimes settling on the Buddleia. These two look like they are about to have a go at a bit of mating. 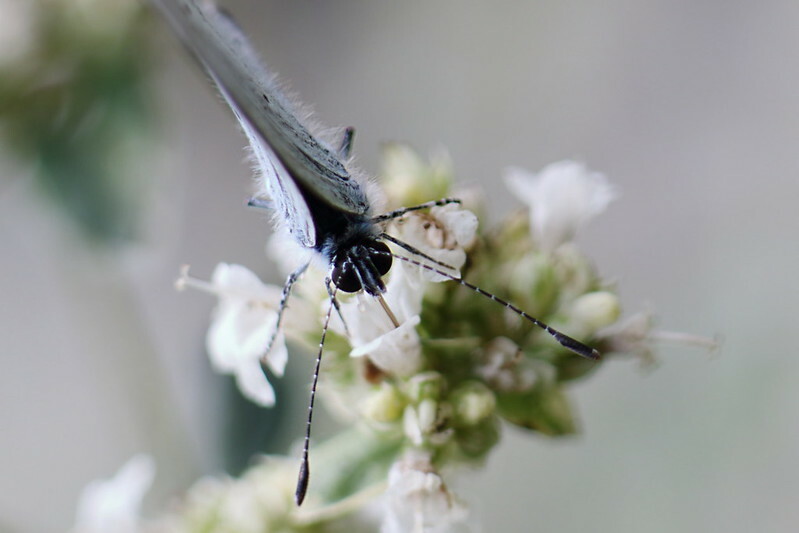 Large White. 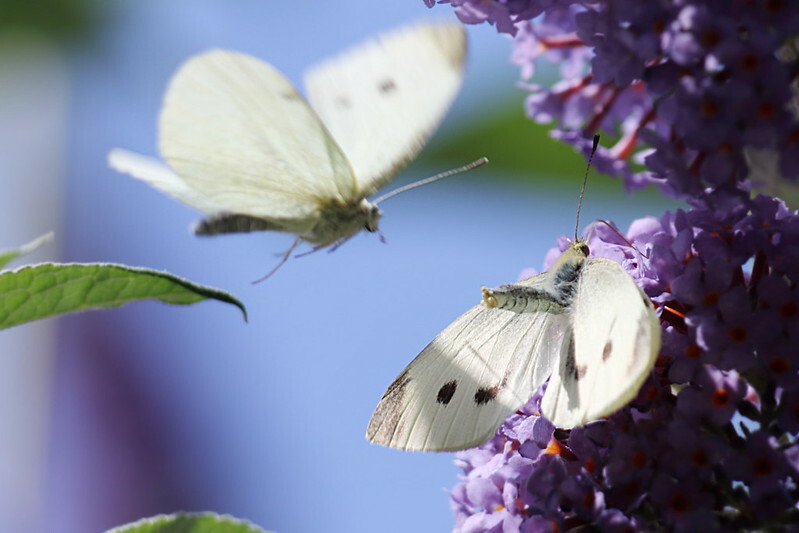 Though I must admit to wondering if they are Small Whites. 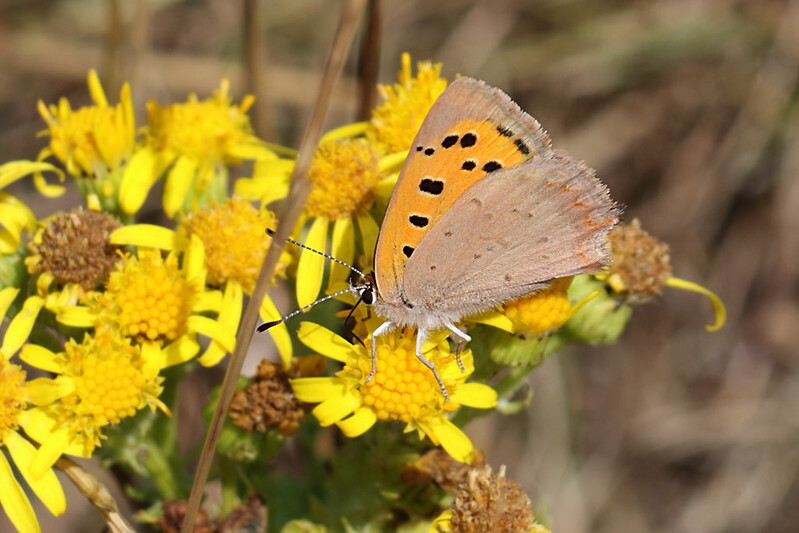 I am hoping to get some more photos of the smaller ones that have pale yellow undersides to their rear wings. 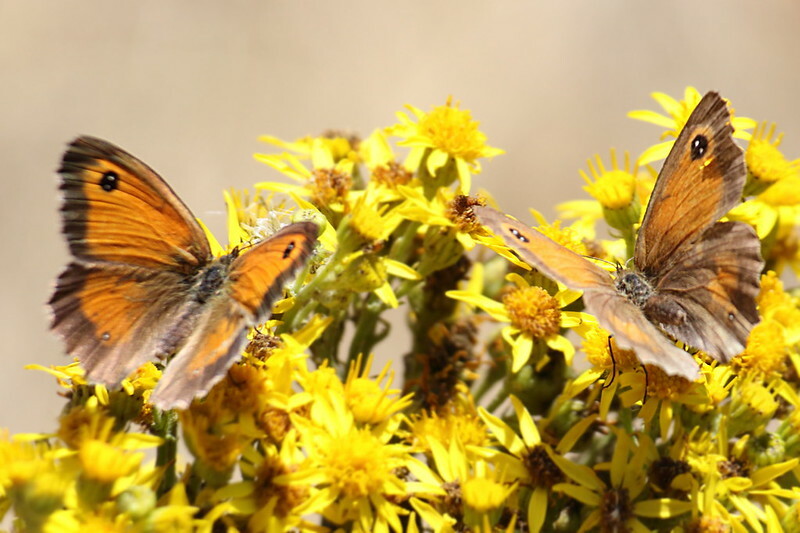 A couple of times I have spotted a Gatekeeper (Pyronia tithonus) in the garden but these 2 were seen on Baildon Bank. 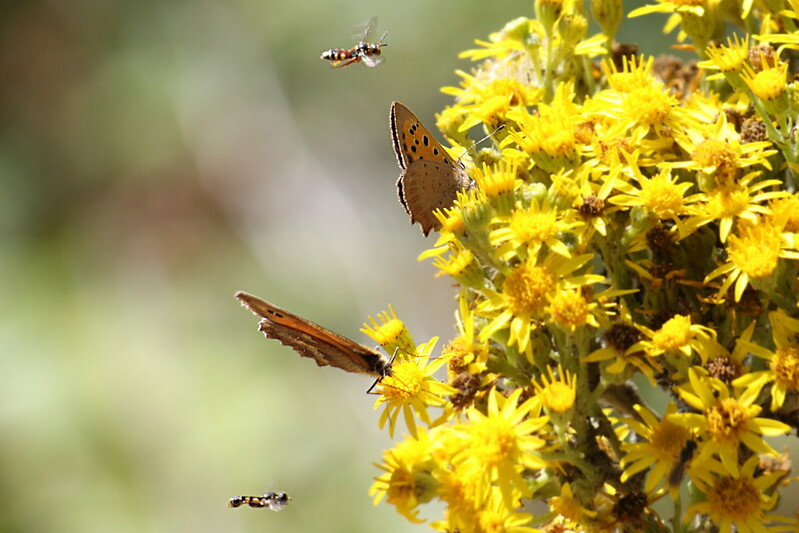 Here we have a Gatekeeper, a Small Copper and 2 small wasps(?) out on Baildon Bank. 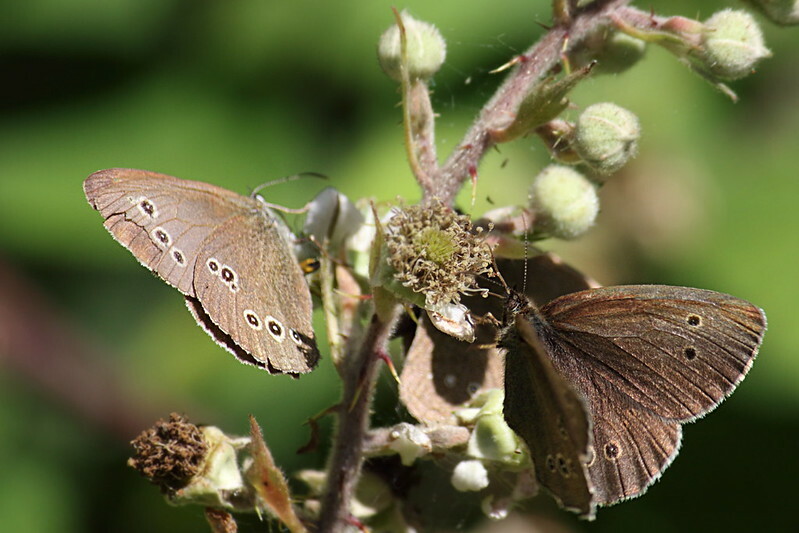 Here we have 3 Ringlet butterflies sharing a Blackberry flower. 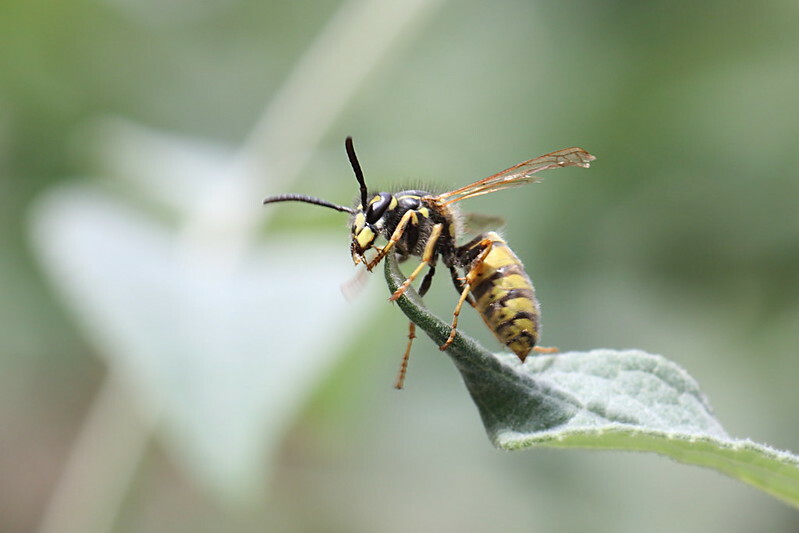 Another photo on flickr shows one of them with a wasp. 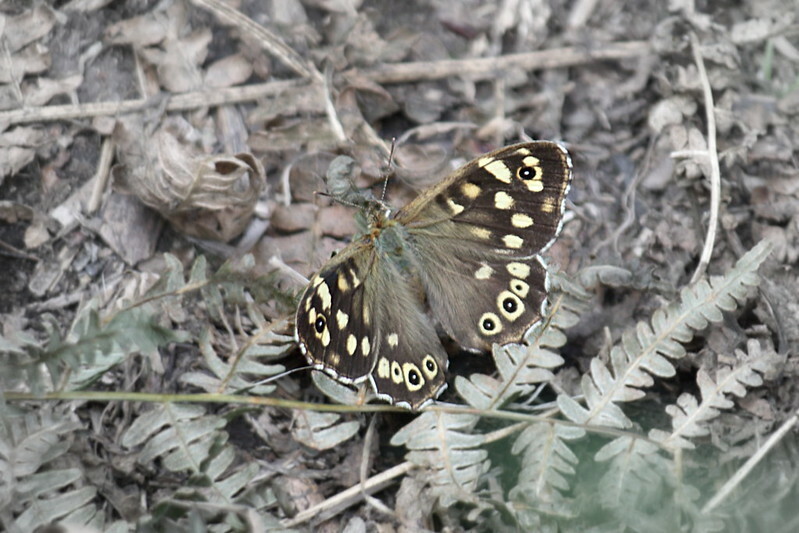 Speckled Wood (Pararge aegeria) butterflies are one of those that you suddenly see flying up from the grass of path as you get close. 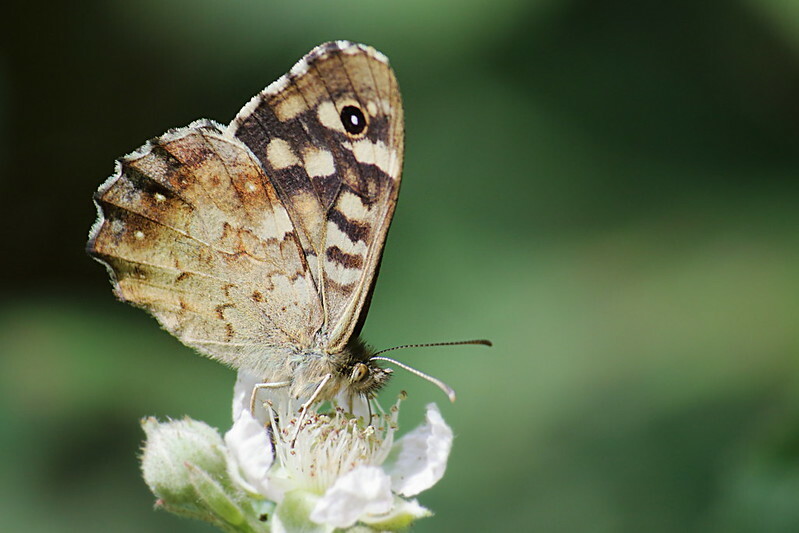 As the Speckled Wood flies off it might disturb another and they can spend some time flitting around each other in the speckled sunlight. 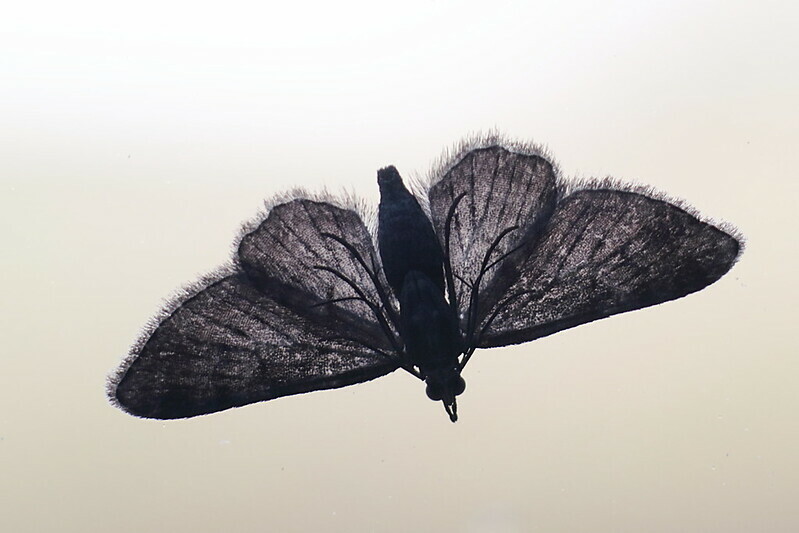 I spotted this moth silhouette on our dining room window with the evening sun shining through it. I have no idea what kind it is other than quite small. 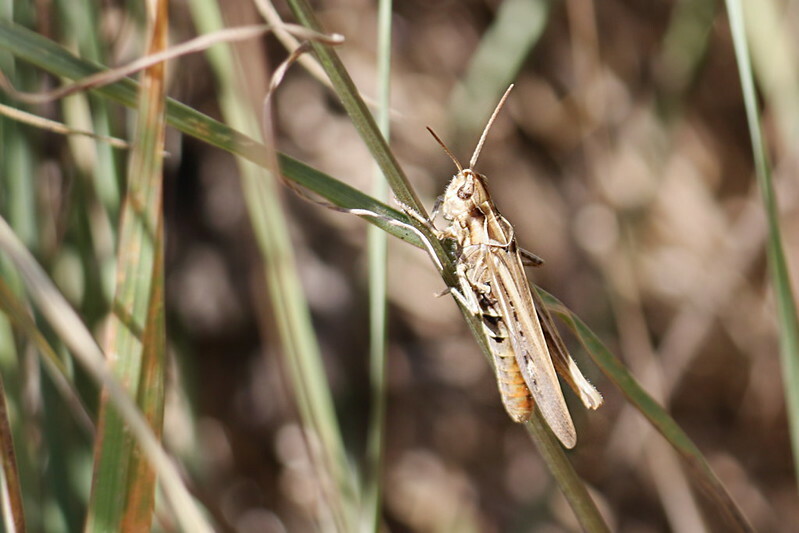 Out and about I could here Grass Hoppers and several times saw something jump away from me. After seeing where one landed I managed to get close enough to take a photo. Several years ago I remember hearing Grass Hoppers at Baildon Green and found lots of them on the short stone pillars next to the path. 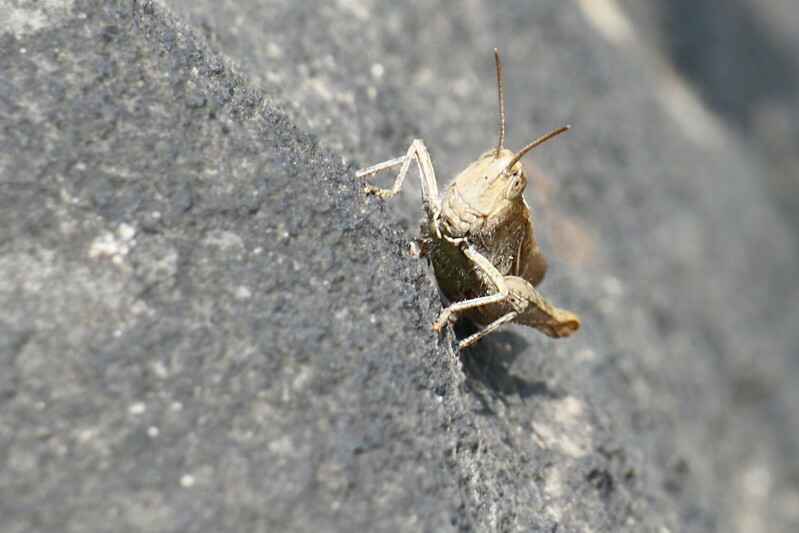 For quite a stretch between Thompson Lane and Baildon Green there seemed to be between 5 and 15 Grass Hoppers on each stone pillar. So this week I glanced at each pillar as I walked past. I only saw 1 Grass Hopper. 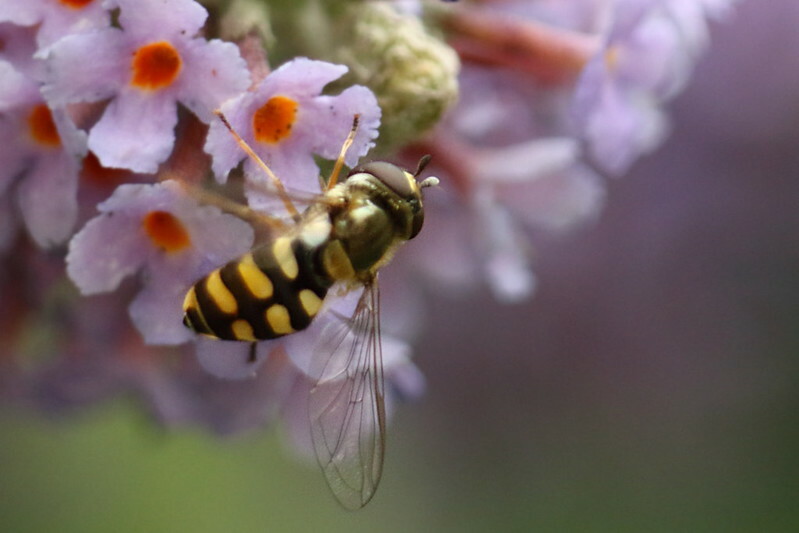 Back home I had noticed insects on the Buddleia varying in size from tiny to small. 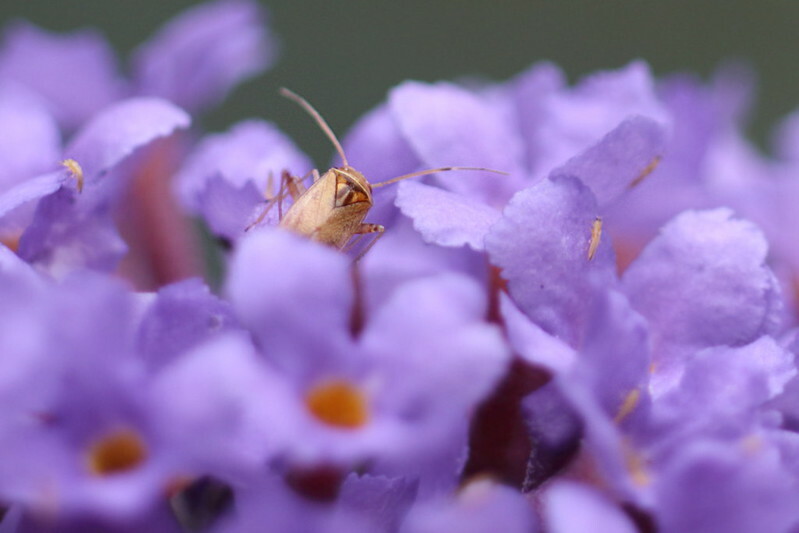 A couple of other photos show that the Buddleia was teeming with these tiny ones. 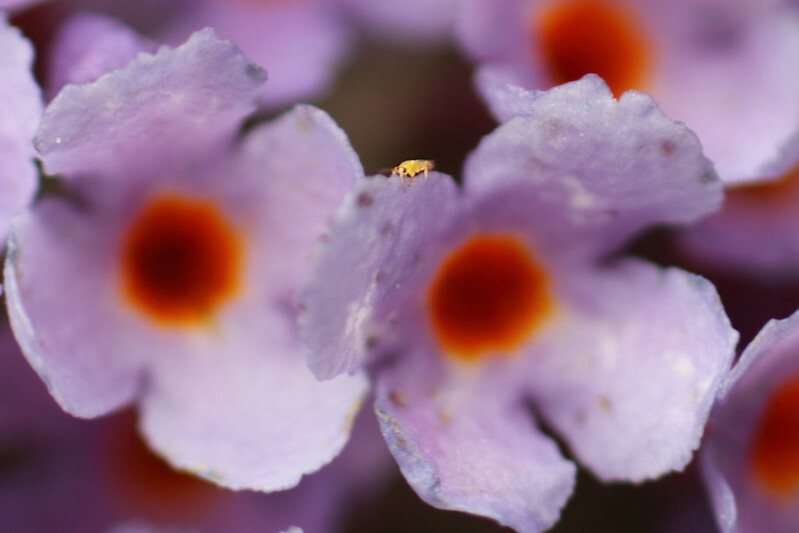 Tiny insects on the Buddleia – Several of the flower heads had dozens of these little critters. 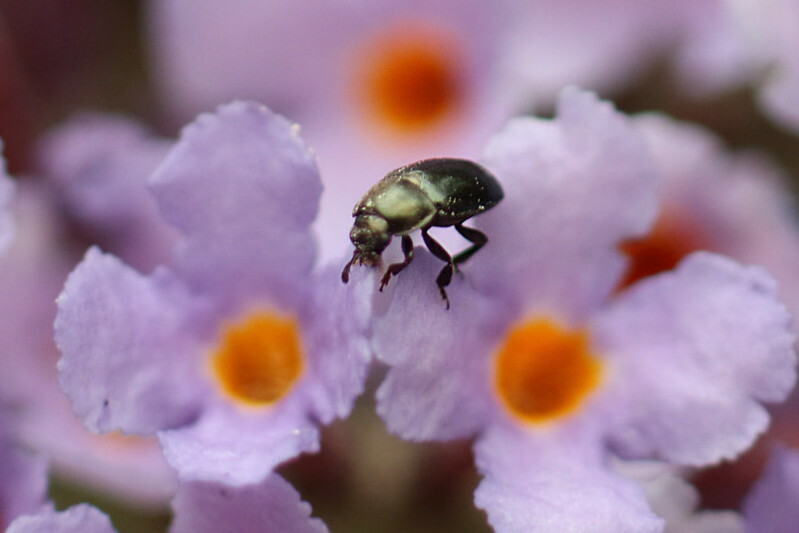 Very similar to the pollen beetles I saw on the thistles ner Shipley Station. 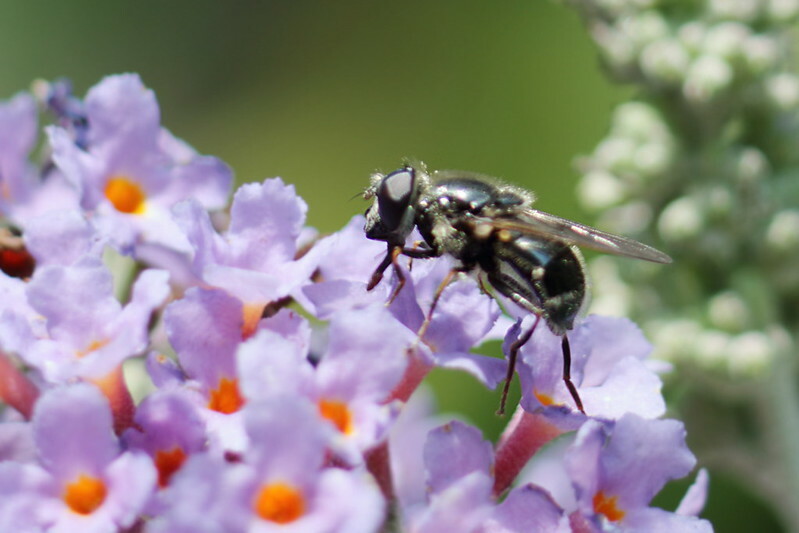 Tiny and small insects on the Buddleia. Here we are actually looking at the back of the small beetle, almost from behind it. Its “shoulders” look very much like a head with what could be a mouth ready to bite any predator. 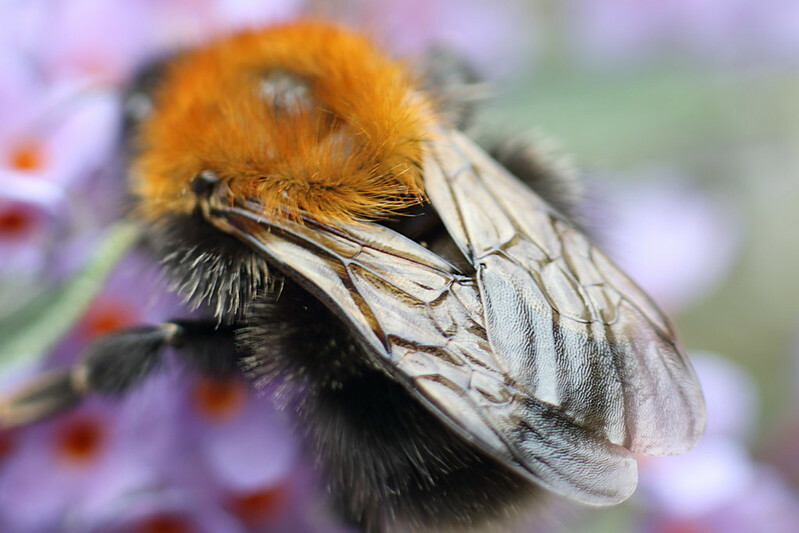 As were White Tailed Bumblebees but not in such large numbers. 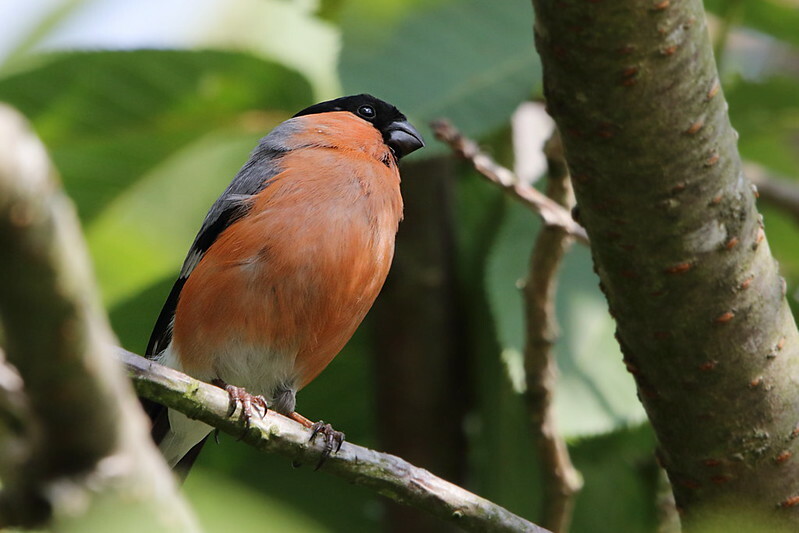 While I was watching the wildlife around the Buddleia a Bullfinch or two flew between the houses and I managed to spot were one landed. 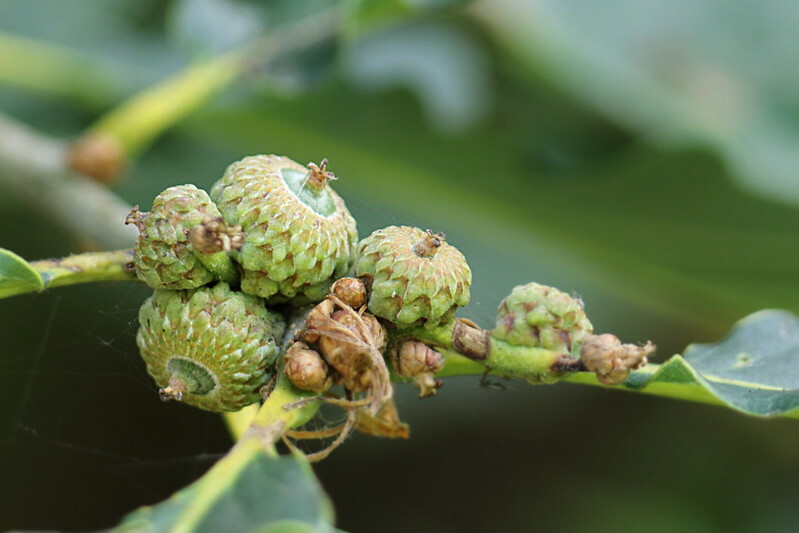 Acorns growing on Oak trees on Baildon Bank. 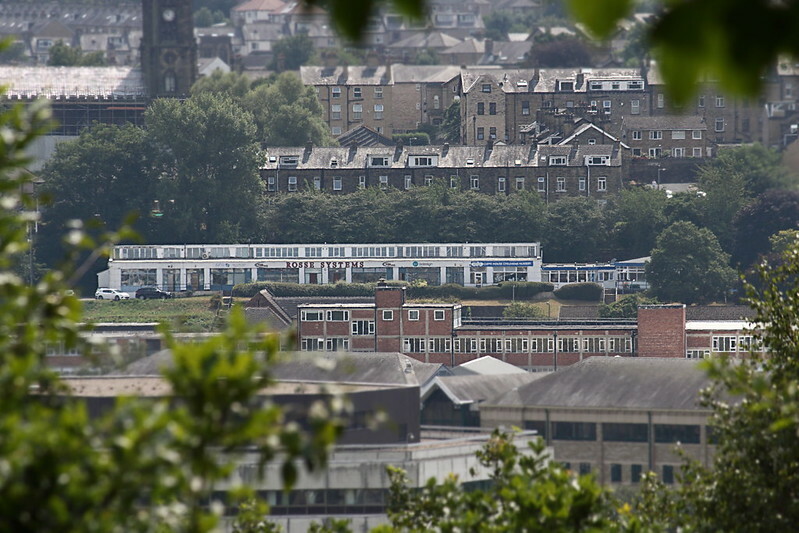 At several places along Baildon Bank you can get good views out over Saltaire. 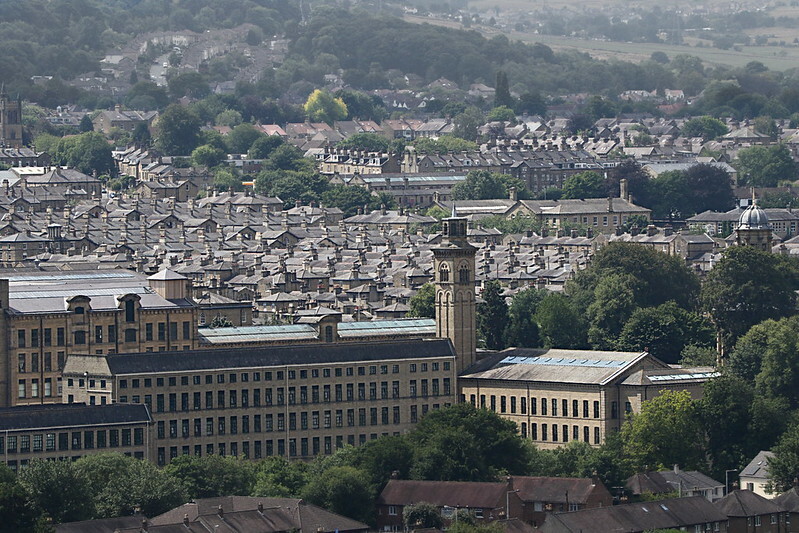 This is New Mill/Salt’s Mill and Saltaire village. 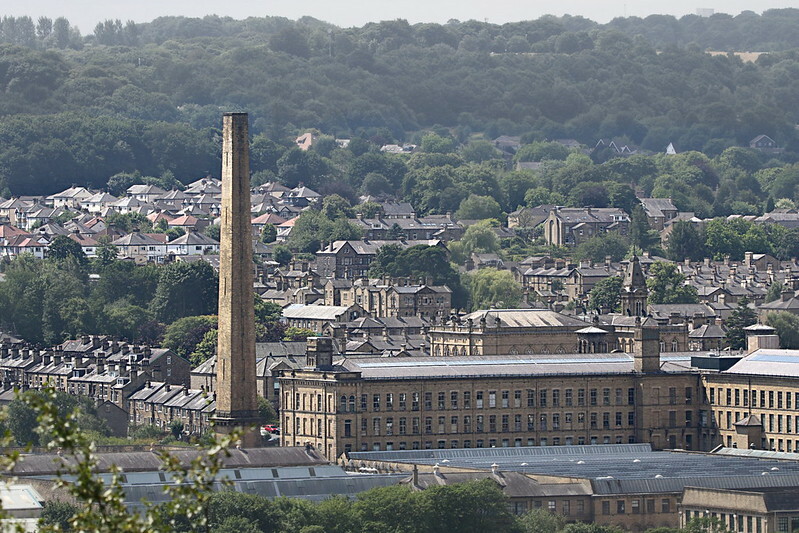 And this view of Salt’s Mill from Baildon Bank shows the chimney. You can see some photos of mine taken from the top of the chimney here. When I am walking about around grass I keep my eyes open for regular shaped holes or tracks. 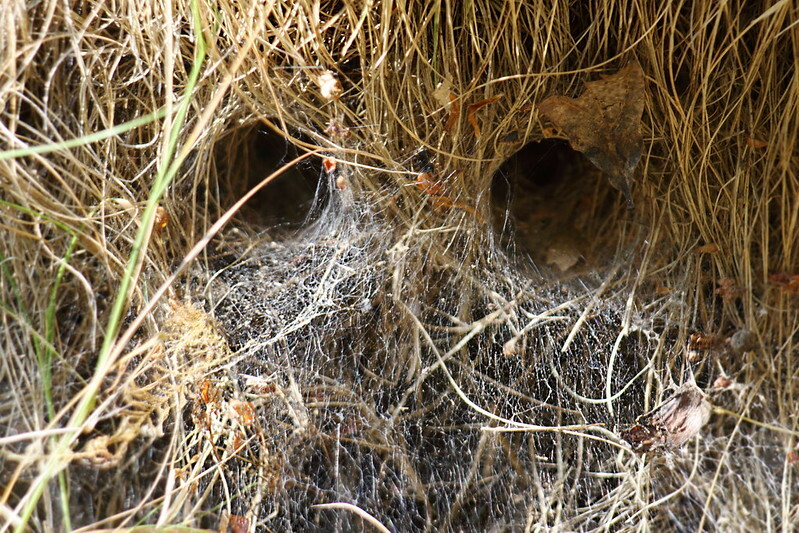 These two looked big enough for a small rodent but look as though they are used by spiders. It was strange to see 2 next to each other like that.